If you thought Mini buyers had a lot of accessories to pore through, better sharpen your number-two pencil. 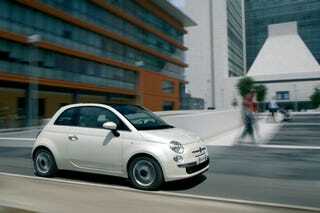 The Fiat 500's order sheet is like sweating out the SATs, without the raging hangover. Need a refill for the "Summer citrus fruit+Essence of the night+Breath of freedom" diffuser? Better check it off. Frau leather upholstery? Check. Ivory jacket-hanger for front head-restraint? Check. No, a black one. Check. "Italian flag" badge for wing? Check. Barcode racing stripe? What the hell. Click through for more customization trinketry.